WHAT IS ASSISTED LIVING? Assisted living facilities are for people needing assistance with Activities of Daily Living (ADLs) but wishing to live as independently as possible for as long as possible. 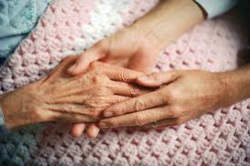 Assisted living exists to bridge the gap between independent living and nursing homes. Residents in assisted living centers are not able to live by themselves but do not require constant care either. Assisted living facilities offer help with ADLs such as eating, bathing, dressing, laundry, housekeeping, and assistance with medications. Many facilities also have centers for medical care; however, the care offered may not be as intensive or available to residents as the care offered at a nursing home. Assisted living is not an alternative to a nursing home, but an intermediate level of long-term care appropriate for many seniors. Nursing homes are designed to care for very frail people that are not able to care for themselves and have numerous health care requirements. Assisted living facilities are designed to assist elderly persons who are able to care for themselves except for a few activities. Assisted living facilities are often deemed necessary when the person in question needs help preparing meals, bathing, dressing, performing household chores, is sometimes confused, or is experiencing memory problems. WHEN TO CONSIDER ASSISTED LIVING? It has been our experience that too many families wait until there is a crisis to consider assisted living for their loved one. When a crisis happens, the senior is usually frail and unable to take advantage of all the benefits assisted living has to offer. Many families tell us the wished they would have moved their loved ones sooner. WHAT ARE SOME SIGNS IT'S TIME TO SERIOUSLY CONSIDER ASSISTED LIVING?